Controversial Kenyan rapper, Prezzo, has for the past few days been the talk of town because of his uncouth behavior during last Friday’s Friday Briefing show hosted by KTN’s Betty Kyalo. The king of bling, who was alleged to be tipsy during the 16 minutes interview, was seen seducing Dennis Okari’s wife, a move which prompted Kenyans to criticize him with all manner of insults. 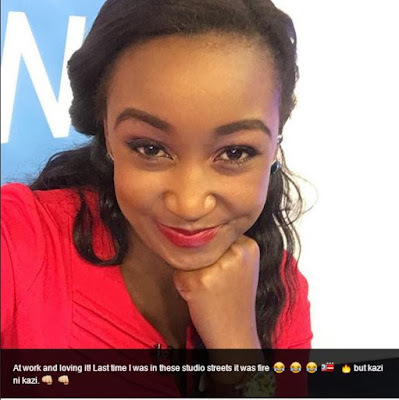 Betty Kyalo, who fell the victim of Prezzo’s uncouth behavior, reported back to work on Monday morning and she was excited about her job. Captioning a selfie photo which she had posted on Instagram, Betty Kyalo joked about her last time in studio being "fire".